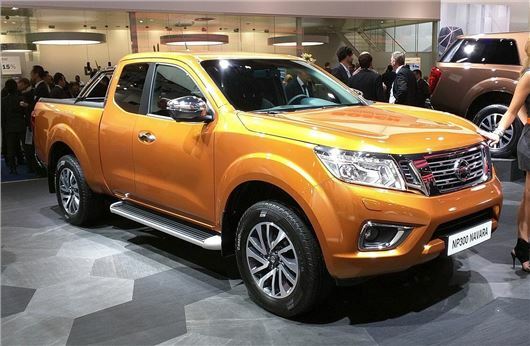 Nissan has revealed the European version of the new Navara which will go on sale here in January 2016. Prices and specifications have yet to be confirmed but we expect it to cost from around £23,000. It will be powered by a new 2.3-litre dCi engine available with either 160PS or 190PS, the latter with twin turbochargers. Smaller than the outgoing 2.5-litre unit, the new engine is around 24 per cent more economical, although we don't have exact figures yet. The current 2.5 dCi averages around 35mpg. The new Navara will be available with two or four-wheel drive with a six-speed manual gearbox as standard or an optional seven-speed automatic. The maximum payload and towing capacity have both increased with the latest Navara able to carry in excess of one tonne and tow up to 3500kg. The load bed is also longer with an extra 67mm in the Double Cab version while the King Cab has a 1788mm load bed. Thanks to a new five-link rear suspension in the King Cab, Nissan claims the new Navara drives like a crossover with improved ride and handling. The King Cab sticks with a traditional leaf spring suspension but this has been updated and should mean less road noise. The new interior gets a fresh dashboard layout designed to provide more cabin space while there are special Spinal Support front seats, engineered using know-how from NASA. Dual-zone digital climate control is available while other additional features include a new rear cab ventilation and seat design. Nissan is also introducing a five year or 100,000 mile warranty with the new Navara. The outgoing model came with a standard three year or 60,000 mile warranty.